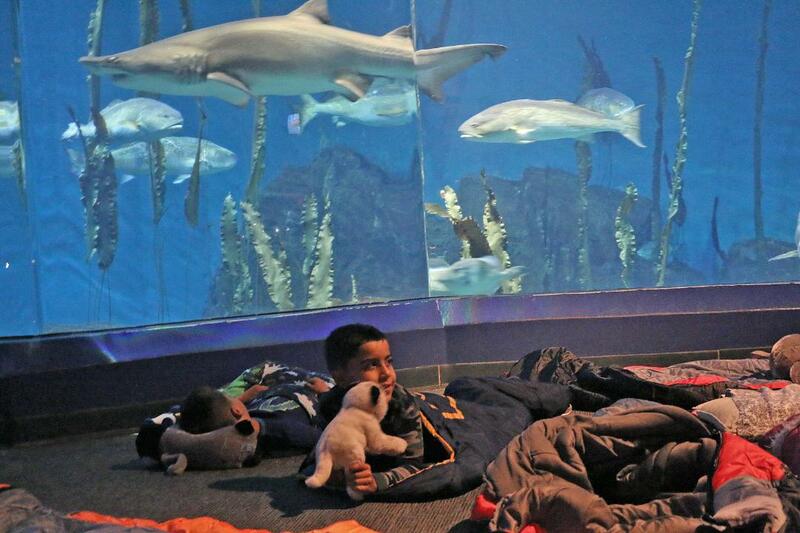 Wear your jammies among the jellies and sleep with the fishes on Fri., Jan. 18 during a fun “Family Sleepover” at The Maritime Aquarium at Norwalk. This night of special access is open to children age 5 & older with an accompanying parent or caregiver over age 18. After check-in at 6 p.m. and a tasty dinner, Aquarium educators will fill the evening with a fun- and fact-filled behind-the-scenes tour, games, crafts, snacks and more. “Lights out” is at 10:30 p.m. Participants sleep in sleeping bags (BYOSB) throughout the Aquarium galleries. Air mattresses are allowed for adults. Breakfast the next morning will be at 7:30 a.m., followed by a private seal-training demonstration at 8:30 a.m. and screening of the award-winning IMAX movie “Backyard Wilderness” at 9 a.m. Everyone will be on their way home by 9:45 a.m.
Advance registration is required. Space is limited and expected to fill up fast. Tickets are $85 for adults and $80 for children 5-12 ($75 and $70 for Aquarium members).